This is one of the most beautiful magic tricks in the world. The magician tears a corner off a sheet of tissue paper. He crumbles it into a ball and lays it on a Japanese style fan. 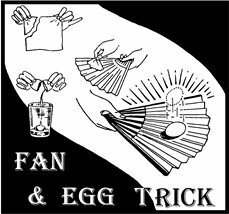 Using the fan to repeatably bounce the ball up into the air and catch it on the fan again, the ball of paper slowly transforms into an egg! The egg is then taken from the fan and broken into a glass to prove it is real. Another way to do the effect is to place the small piece of paper into a brandy snifter type glass. The glass is slowly shaken around and around, back and forth until the paper slowy transforms into an egg. The egg is then poured out of the glass into the magician's hand and then is broken into the glass to prove it is real. This outfit comes with the egg and instructions. Brandy snifter and fan not included.